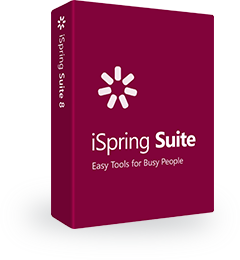 This April, we released the new version of iSpring Suite, our full-featured eLearning authoring toolkit. The brand-new Suite 9 offers 16 new ways to present learning content, including advanced video courses, beautiful drag-and-drop exercises, and new interactions. Many instructional designers and eLearning experts have already tried out all the new features and published their reviews of iSpring Suite 9. Many of them were impressed and recognized a major breakthrough, looking back at the previous versions. The new version has advanced the product by leaps and bounds, says Jane Bozarth, the director of research for the eLearning Guild. It has the ability to reduce the number of licenses you need to purchase for a team, and save time, as Michael Cerantola, the Interactive Development Manager at KnowledgeOne, suggests. They say to never believe everything you read on the Internet; it’s full of fake news. So let’s double-check if iSpring Suite 9 is really THAT great. Or do the eLearning gurus need to take off their rose-tinted spectacles? Do you believe the revamped iSpring Cam Pro can really do as much as change the staff training process? In the words of Laszlo Nakovics, the executive editor at Techwok.hu, iSpring Cam Pro can be used to create high-quality screencasts to train newbies and show them how to work with your company’s software. You can capture your screen and then complement the video with subtitles, annotations, images, and highlights. In most cases, there’s not even any need for post-production in other video editors. After all, Harold Muliadi, a Graphic Artist and Illustrator at Relate Corp, admits that iSpring 9 Cam Pro’s video editor is shaping up to be a very useful and convenient editing tool. “We are creating How-To videos, featuring specific techniques. It is increasing productivity internally to create these—so simple to edit and maintain—and the capsules are small enough that users can just select the specific procedure they need help with, and follow along—increasing learner retention for the next time”. No more face-to-face trainings on the workflow basics? — Check! iSpring Suite 9 kills the need for other single-purpose software, for example, screen recorders and video editors, like Camtasia. Michael Cerantola couldn’t agree more when he said that this reduces the number of internal costs they spend on licenses for other software, such as Camtasia, as most of Camtasia’s features have been packaged within iSpring Cam Pro. Let us not forget the vast audio editing capabilities for recorded narrations with noise removal, volume adjusting, fade -in and -outs and much more. Multiple solutions in one tool to reduce software costs? — Check! Laszlo Nakovics finds it great that he does not have to worry about the interaction layout and graphic design when working with iSpring Visuals interactions. Version 9 has twelve new wizard-based interactions to cover all imaginable matters when showing content in a presentation-like manner is not enough – Accordion, Circle Diagram, Cyclic Process, FAQ, Glossary, Guided Image, Hotspot, Labeled Graphic, Media Catalog, Steps, Tabs, and Timeline. Making the users truly engage with the content? — Check! It might seem hard to justify such a rich statement coming from Jane Bozarth, but let’s try. Jane Bozarth was so impressed with the next-level drag and drop that it feels almost magical to her to be able to do it now in a matter of minutes. Joe Ganci, the President at eLearningJoe, adds that with Version 9 you can make any objects draggable or act as targets, determine which objects should be dragged to which targets for the learner to get the correct answers, and make objects draggable but that don’t have targets. Fast to create AND easy to customize? — Check and check! But are drag-and-drop questions the only thing to contribute to QuizMaker 9 being incredible? No, there is more to offer. Joe Ganci highlights its much more flexible feedback in the form of full pop-up windows that can be scrolled and can include many images, videos, shapes, text blocks, equations, hyperlinks, and more. This allows for much more specific instructional feedback. Now every wrong answer will be explained more thoroughly than ever before. No more knowledge gaps? — Check! Finally, Laszlo Nakovics is happy that the quiz questions are responsive, so their layout adapts neatly to the size and orientation of the device’s screen. Training on the go? — Check! Now, let’s sum it all up and see if all the myths proved to be true. Well, it seems we have nothing else to do but believe the experts and their nice words about iSpring Suite 9 with its three highlights, Cam Pro, QuizMaker, and Visuals. Download a free 14-day trial of the newest iSpring Suite 9 and test drive all the features that we discussed above. Looking forward to your feedback, reviews and success stories!